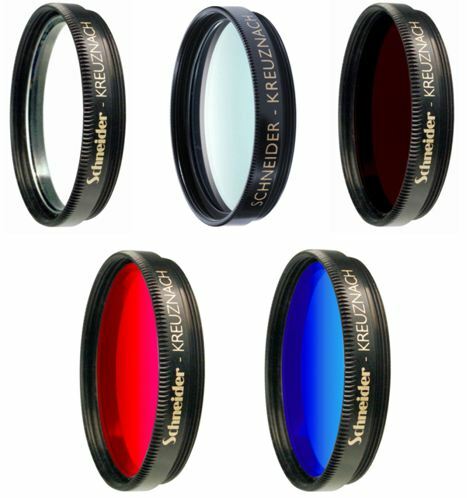 Schneider Optics’ line of UV-Cut, IR-Cut, and color filters are designed for use in industrial applications involving research, engineering, and production. These filters feature improved optical quality, are provided with detailed technical parameters, and have passed a strict quality assurance process. UV-cut filters are long pass filters that block the UV wavelength range and transmit the visible. These filters use an absorptive glass, which is robust, cost-effective and insensitive to angle of incidence. In machine vision applications they are used in front of a lens on a CCD or CMOS camera to protect the sensor from UV light, in absence of internal protection in the camera. In addition, they are often used to protect expensive lenses from potential damage. Red and yellow filters are long-pass filters that pass light at wavelengths longer than their characteristic cut-on wavelength–typically the wavelength at which the transmission is 50% of the maximum. These filters use absorptive glasses that are robust, cost-effective and insensitive to angle of incidence. In machine vision, one of their typical applications, they are used in front of a lens on a monochrome CCD or CMOS camera to improve image contrast. The appropriate type of filter has to be selected with respect to the color of the object and the type and/or color of the illumination. These filters are available unmounted or in mounts with all common thread sizes. Green and blue filters are band-pass filters with a specific spectral transmission characteristic that transmits light that is perceived by the human eye as the corresponding color. These filters use absorptive glasses that are robust, cost-effective and insensitive to angle of incidence. In machine vision, one of their typical applications, they are used in front of a lens on a monochrome CCD or CMOS camera to improve image contract. The appropriate type of filter has to be selected with respect to the color of the object and the type and/or color of the illumination. These filters are available unmounted or in mounts with all common thread sizes. Neutral Density Filters attenuate light by absorption. Schneider Optics controls the thickness of the filter material, resulting in a wide range of filters with different attenuation levels. These filters are particularly useful for preventing camera overexposure by adjusting intensity levels. Polarizing Filters are made with dichroic sheets of laminated polymers that are cemented between protective glasses. Schneider offers both linear and circular versions of these filters, as well as edge sealed versions. Polarizing filters are ideal for 3D projection, microscopy, material testing, machine vision, and other imaging applications. Anti-Reflection Coatings reduce image contrast and prevent ghost images by minimizing incident light reflection. An uncoated glass surface can reflet anywhere between 4-8% incident light. Schneider Optics offers AR coatings for the visible and NIR spectrum. Band pass filters (BP) that transmit light only around a certain center wavelength. Long pass filters (LP) that transmit light with wavelengths longer than a certain cut-on wavelength. Short pass filters (SP) that transmit light with wavelengths shorter than a certain cut-off wavelength. Absorption filters that suppress the undesired part of the spectral energy by transforming it into heat in the bulk of the filter material. Reflection filters that reflect the undesired part of the spectral energy back from the filter surface by interference (interference filters). Reflection filters are made by depositing multiple layers of materials with differing refractive indices on to a glass substrate. The spectral characteristics of these filters depend upon the angle of incidence of light. By designing a specific thin film layer system, nearly any desired transmission characteristic can be achieved. By combining both principles, i.e. using an absorptive glass as substrate for the multiple thin layers, special spectral characteristics can be achieved. For OEM volumes, we offer the design and manufacture of an appropriate filter per special requested transmission characteristic. Additional information can be found on the datasheets below.